Once upon a time, when arcades were still a big deal, the beat-em-up was a major, major genre. It was popular for the same reason that shooters and the like are popular today; the beat-em-up was visceral in its violence, and it was designed around the multiplayer experience. You could play these games by yourself, but the real fun was in working with a couple of other people to quest through the action together. They were also infamous for being difficult, difficult games. Arcades wanted to swallow up cash more quickly than microtransactions in mobile games do today, so the challenge level of each game was astronomical, even if the games themselves ran to around an hour in length. Actually getting to the point where you could complete any beat-em-up with a single coin was a process that would cost you a lot of money. It’s not a favourite genre of my own, to be honest, but since picking up my arcade game table earlier in the year, I’ve found myself playing these games fairly frequently. Firstly, because they don’t cost me money any more, though I have the arcade original versions, rather than the watered-down console editions. Secondly, because they’re good for some fast, furious action, and I generally like to use my table to flit through a number of different games each play session. 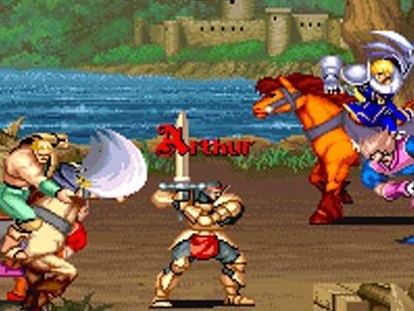 Developed by Capcom and released in 1991, Knights of the Round is based on the King Arthur story (obviously enough). In the game you control one of three heroes - Arthur himself, Lancelot or Perceval, with the goal to overthrow the warlord Garibaldi and unite England. This game does a really good job of setting the medieval England scene, complete with so many different types of soldiers and knights to fight. Some are incredibly unrealistic - the swashbuckling rapier wielders in masks, for example, are more a fit for a renaissance setting than ancient England, but the beat-em-up genre hasn’t exactly been one focused on historical accuracy over the years. The range of enemies is vibrant and different, and that’s what’s important here. There’s also an RPG-like levelling mechanic, which is a really nice touch, as it provides you a sense of progress as it simultaneously ruins you. The game allows up to three people to team up together, and there was a Super Nintendo port which capped at two players. Most people associate Ninja Gaiden with rock-hard platformers and, later, incredibly challenging 3D adventure games. What is perhaps less well known is the side scrolling brawler, which - surprise! - is also incredibly difficult. Developed and released in 1988 by Tecmo before Tecmo merged with Koei, Ninja Gaiden looks and feels like a Double Dragon game, only with you in control of a very agile ninja, whose goal is to defeat a descendent of Nostradamus, Bladedamus, in order to prevent the end of the world prophecies from becoming true. The beat-em-up wasn’t exactly known for its intelligent storytelling, either, back in those days. Being able to run up walls and pull off all kinds of crazy acrobatic moves more than made up for that narrative though. This game also has a brutal game over countdown. When your character loses his last life, the screen switches to him pictured tied to a table as a circular saw is lowered towards his body. If you don’t throw an extra coin in in time, the saw reaches the body, and the screen fades to red. Gruesome and dark - in that aspect, this game very much shares a heritage with its similarly-named brethren. This game is a little different to the others on the list in that is was a console game, being available both on Mega Drive and Super Nintendo, but I’ve included it because it’s an absolute delight to play. Perhaps because it was built for console rather than arcade, or because its target audience is likely to be younger, Sailor Moon is slightly easier than many other brawlers - not easy, mind you, but easier. You get to play as whichever of the Inner Senshi you like, on their quest to stop the evil Queen Beryl in her tracks. Along the six levels you’ll fight your way through a few standard enemy types before taking on a boss. Each of the girls have standard brawler movesets, and bosses behave as you’d expect there too. It’s a very standard brawler, in other words, but it makes good use of the Sailor Moon franchise, plays well, and as I said, is slightly more accessible for people who don’t enjoy replaying levels over and over again to try and master them. Based on a popular Japanese television series, Kodure Ookami is a game about a wandering samurai and a baby that he needs to protect from hordes of enemies. If that sounds odd, then just wait until you get the powerup that puts the baby in a pram… a pram that comes loaded with dual guns. Yeah, that’s when it gets a bit surreal. This game’s a little different to some other brawlers in that enemies go down quickly, and so does your hero. Usually with brawlers heroes can take a few hits before they fall over. This gives Kondura Ookami a twitch approach to gameplay. It’s tough, even by the genre’s standards, but it pulls it off thanks to its excellent art, sense of humour, and tight gameplay - the hero might go down easily, but once you’ve got some skill together with counters and the like, you’ll find yourself able to progress quite deeply into the game. The second Tecmo game to appear in this list (the developer really did know its brawlers), this 1989 game was never ported to console, and that’s a pity, because it does a number of really interesting things. You play as the Tecmo Knight, who has the ability to “ride” either a giant beast of a man, or a tiger. The giant man dishes out damage, while the tiger fights at range. Your goal is to swap between these two as the situation demands to make your way through the game’s levels. It’s also an incredibly bloody brawler, with enemies visibly bleeding as you pound into them. They are decapitated when they die, and you can take the heads, either for loot or powerups. Boses are also vivid and memorable, with the first boss - a giant ape whose hands you need to beat off - being a particularly memorable one.